A fantastic bank of sixty three hardware store drawers. 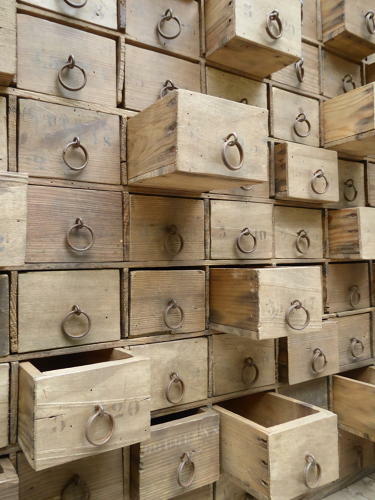 A wonderful large bank of hardware store drawers in solid pine throughout drawer, all sixty three drawers with their original ring handles & the whole piece with a pleasing age related patina. The drawers have some fantstic 'ghost writing' on the fronts relating to the contents they once held, these consist mainly of old stencilled numbers but words suh as 'rivets' can also clearly be made out. Wear commensurate with age, very good original condition showing numerous favorable signs of age, unrestored yet clean & ready to use. The inside of thedrawers could be cleaned further depending on what they are to be used for as they have only had a light brush & the few sporadic woodworm holes have been treated as a precaution.